The program is managed by Eric Weintraub, MD, Associate Professor in the Department of Psychiatry, who is the Medical Director of the UMSOM’s Methadone Clinic in the University of Maryland Medical Center (UMMC) Outpatient Addiction Treatment Services and Christopher Welsh, MD, Associate Professor in the Department of Psychiatry, who is the Medical Director of the UMMC Substance Abuse Consultation Service and Medical Director of the UMMC Outpatient Addiction Treatment Service. Dr. Weintraub and Dr. Welsh have been providing similar services in Western Maryland for the past three years in collaboration with the University of Maryland Medical System (UMMS). The funding is critical as Maryland faces increasing opioid-related deaths. According to the Maryland Department of Health, there was a 14.8 percent increase in opioid-linked deaths during the first half of 2018 from 2017, a trend that has been in place for several years. (See Figure 1). The bulk of these deaths is linked to fentanyl use, a high-potency synthetic opioid. While a large portion of these deaths took place in Baltimore County and Baltimore City (636), rural counties have also experienced opioid-related deaths. Importantly, medically assisted treatment with drugs such as methadone and buprenorphine — considered the evidence-based treatment of choice for managing addiction — is not always available to those in rural areas. To address this, Dr. Weintraub and Dr. Welsh have been prescribing buprenorphine via telemedicine to reach patients in rural areas. In addition, they are a training physicians, nurse practitioners and physician’s assistants in remote areas to treat patients with opioid disorders. 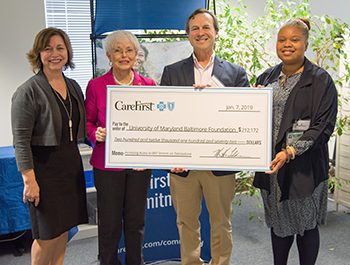 “We were very excited that the University of Maryland School of Medicine came to us with this project because we thought that it brought services to where they needed to be with their expertise,” said Julie Wagner, VP of Community Affairs, CareFirst. Dr. Weintraub and Welsh’s telemedicine program has been in place in Western Maryland for the last three years. With this new funding, the program is expanding further into Eastern shore counties: Dorchester, Talbot and potentially into Queen Anne’s County. In partnership with Life Energy Wellness Clinics, counseling will be provided to substance abuse patients and if they need medications, they can be prescribed this treatment through the telemedicine program. “We got started a little bit early at the end of October and we've already treated 24 patients, I think 16 of whom are still in treatment. We just looked at the numbers. And part of the issue has been that we haven't had the capacity to expand,” said Dr. Weintraub. “Opioid addiction continues to be a growing problem, particularly in rural areas of our state. Dr. Weintraub and Dr. Welsh have truly advanced the way we can address this issue and treat those in need through telemedicine. The generous funding from CareFirst will help expand a program that has already been successful in other parts of the state,” said E. Albert Reece, E. Albert Reece, MD, PhD, MBA, Executive Vice President for Medical Affairs, UM Baltimore, and the John Z. and Akiko K. Bowers Distinguished Professor, and Dean, University of Maryland School of Medicine.